If you’re looking for something indulgent for Valentine's Day, Mother’s Day or another festive holiday party, look no further than this Easy Dairy Free Chocolate Fondue recipe! Unlike other chocolate fondue recipes, this easy chocolate fondue uses coconut cream instead of whipping cream. So if you have a food sensitivity to dairy like me, you can indulge in as much chocolate fondue without worrying about a tummy ache the next day! This Easy Dairy Free Chocolate Fondue is so rich and creamy that you’ll find it very filling. After dipping a few strawberries or marshmallows, I go into chocolate overload and feel that I’ve had enough. 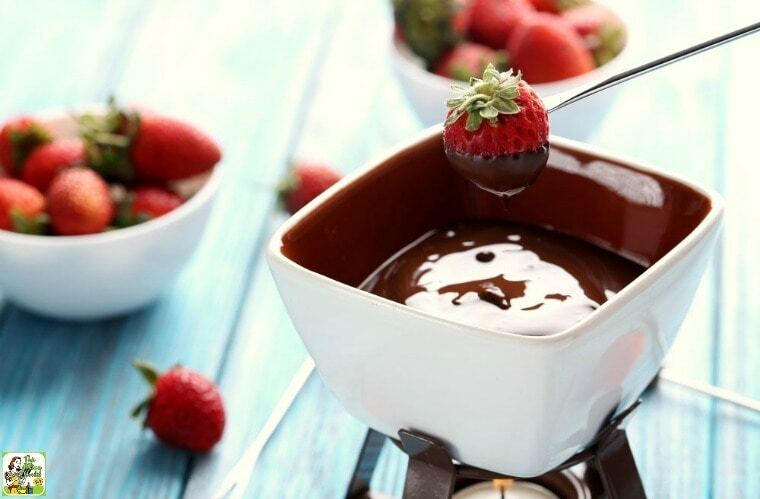 That’s why this dessert fondue is the BEST chocolate fondue recipe for parties. A little goes a long way! 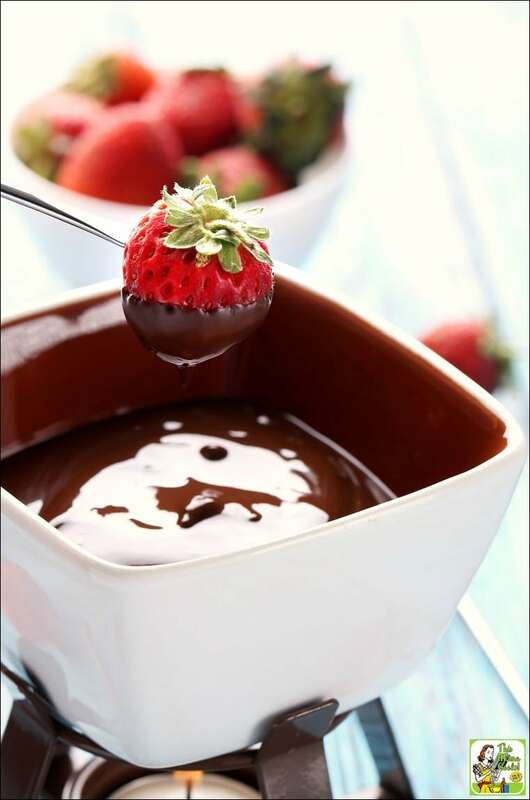 So what are the best chocolate fondue dippers for this easy chocolate fondue recipe? If you’re not gluten free, pieces of Sara Lee pound cake (cut into cubes) are amazing. 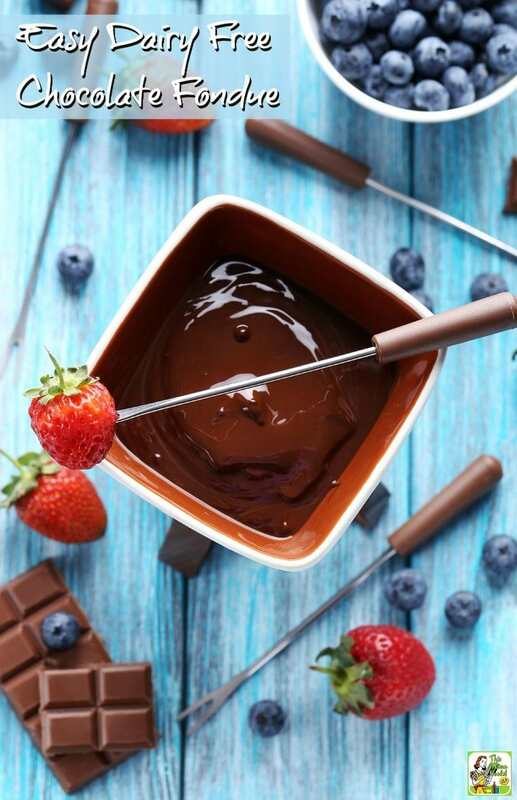 To keep your chocolate fondue recipe dairy free, not only do you have to use coconut cream (not milk), you also have to find the right kind of chocolate. My favorites are dairy free semi-sweet chocolate chips like Guittard or Enjoy Life Semi-Sweet Vegan Chocolate Chips. Chips work best in fondue recipes since they melt quickly. When I’ve made Easy Dairy Free Chocolate Fondue for Mother’s Day and Halloween, we ended up having leftovers. If that happens to you, just keep the chocolate fondue in the pot, cover it with aluminum foil, and put it in the refrigerator. The next day, just reheat the chocolate while you’re eating dinner. Then you’ll have more easy chocolate fondue the next night (or two) for dessert. You can also put leftover Easy Dairy Free Chocolate Fondue into a square cake pan and chill to make an easy refrigerator fudge. Just cut off a piece when you want to indulge in some creamy chocolate – awesome! I used to have an old green aluminum fondue pot from the ‘70s that I found at a thrift store. It was good at keeping both cheese and easy chocolate fondue recipes warm with a candle even though it was pretty ugly! Luckily, I received a Le Creuset Enameled Cast Iron Fondue Pot as a Mother's Day gift. It's gorgeous and works great with my induction cooktop. I love using it for chocolate fondue since you can prepare any fondue recipe in the fondue pot right on the stovetop. This saves you the step of using another pot and then transferring the chocolate fondue. But if you’re looking for a more reasonably priced electric fondue pot, I highly recommend the Cuisinart Electric Fondue Maker. In a medium sauce pan or stovetop safe fondue pot, heat coconut cream over medium heat until hot. Add chocolate chips. Lower heat. Stir until chocolate is fully melted. Transfer to fondue pot, if needed and serve warm with favorite dippers. Originally posted on February 28, 2014 and May 5, 2016. Updated with new pictures. This is the most delicious substance I have ever eaten! I made it for a baby shower today and the guests loved it! Thank you so much for an amazing recipe! I will definitely be making it again! I couldn’t find coconut cream in a can but found coconut creamer. Can that be used? Thank you! Coconut creamer, like So Delicious Coconut Creamer, is made with coconut cream. But since it’s made with mostly water and has added sugar, I wouldn’t use it. You could try using full fat (not lite) coconut milk. But it won’t be quite as creamy. Yes! Refrigerate the fondue and slowly reheat before serving. Leftovers can be refrigerated and reheated later, too! Can I use this recipe for a chocolate fountain? I can’t find non-dairy fountain chocolate. Drue, I honestly don’t know if you can or not. Sorry. I don’t want to say yes and have your chocolate fountain get clogged up and broken. Thank you for the reply. I’m going to try it (why not live on the edge, right?) and hopefully I will remember to post my results here. I would say you could use it with a fountain the key with fountains is that there is enough oil in the mixture to make it thin enough to go through. So add a little warm Canola oil to thin it out a bit and then it should work. You may have to test run to see how much oil to add. I would only start by adding 2 TBSP to 5 lbs of chocolate. Thanks for the great tips, Chef Elizabeth! And since the fondue is coconut milk based, maybe using a coconut oil instead of canola oil, would be a good choice, too. Amazing. This will quickly be moved from my recipes to try folder into my favorites folder. The chocolate stays more liquid than when use dairy cream so you can have a party without having everyone crowded around your outlet, if you have an electric fondue pot. Definitely my new go to fondue recipe.